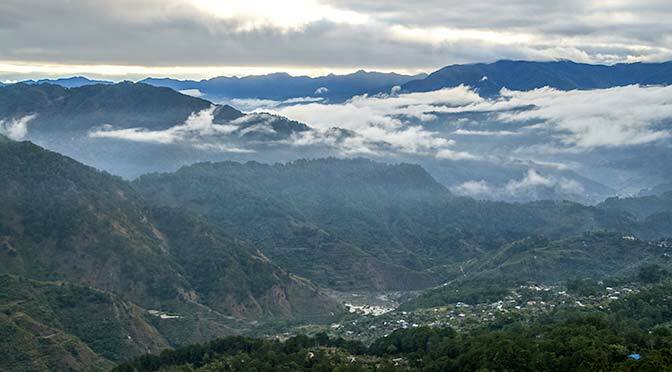 Tour guides in Sagada, Philippines are very available and heavily suggested for all activities. We may be gluttons for punishment, overly independent, or just plain cheap by not using them. Regardless, we opted to hike to the Kiltepan “sea of clouds” sunrise viewpoint on our own. 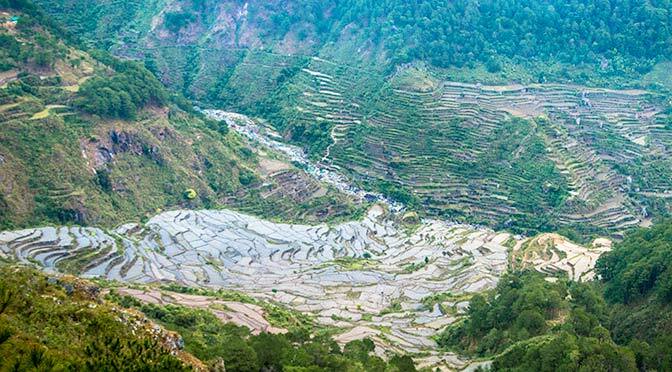 rice terraces below the sea of clouds in Sagada, Philippines. We woke up at 4am to start hiking since we were not sure how long it would take, exactly how to get there, or when the sun would rise. There were no typical city, street, or car lights in this little village… just the glow from the bright stars. We brought our head lamps to light the way, and saw the Kiltepan Viewpoint sign after an hour of hiking on the main road leading out of Sagada. Turning left at the sign, we continued up the mountain on a rough, gravel, switchback road. The tour vans (and guides) that we denied earlier, were now filled and passing us on their way up the mountain. My excitement for this romantic sunrise getaway was slowly starting to fade. It was still dark when we reached the viewpoint, and we were barely able to make out the “sea of clouds” that often settles between the mountains over the village. As we were trying to find the perfect spot and settle in, along with the masses, my attitude was continuously getting worse. Not ready for noise, chaos or a crowd so early, I was ready to leave. Until a little miracle happened. Fog came up from nowhere, so thick that you could not even see three feet in front of you. 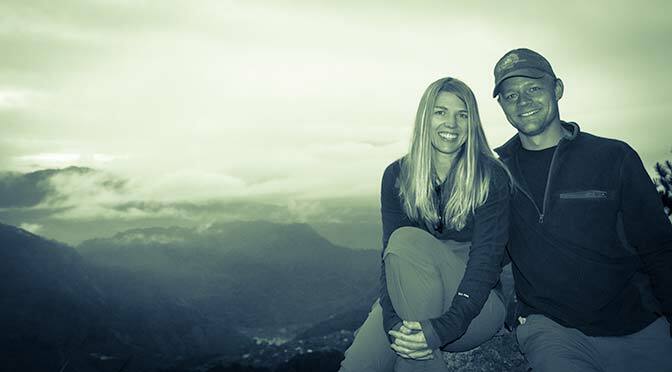 Laura and Thad in front of the sea of clouds. And just like that, the crowds started to load up, and van after van disappeared back down the mountain. As soon as we were the only two left, the fog lifted. We were at the viewpoint for hours watching the “sea of clouds” move effortlessly below us. 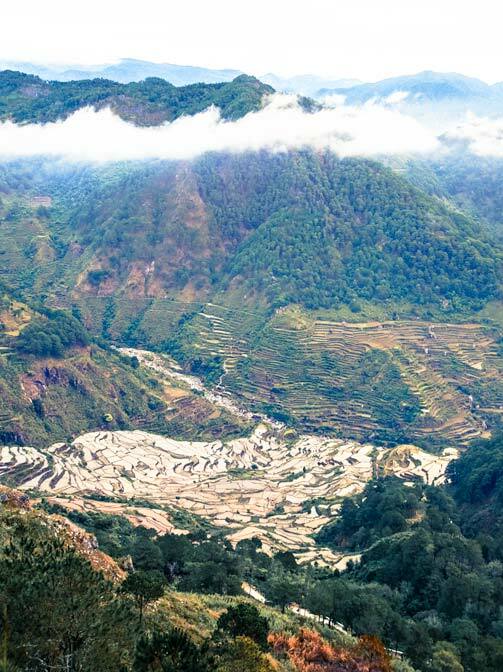 The rice terraces built into the mountain sides were reflecting the sky, the little village in the valley was starting to awaken, and the sun tried unsuccessfully to break through the clouds. With the clouds constantly shifting and changing, the view was always new. The sky was beautiful. The valley peaceful. Several hundred photos later, feeling utterly amazed and satisfied, we headed back down the mountain.